I’m trying to read more diversely this year, and I finally read some non-fiction. I won an ARC of this book way back in 2012 but never got around to reading it, and I was intrigued to find out that it won the Pulitzer and a host of other awards in that time. 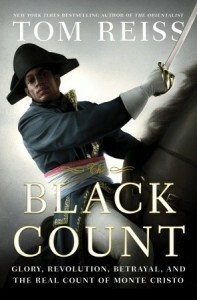 The Black Count is a biography of Thomas-Alexandre Dumas, the father of the famous novelist Alexandre Dumas and the inspiration for many of his stories, particularly The Count of Monte Cristo. Dumas was the son of a French nobleman and an African slave. He was also a martial hero, rising from a lowly private to general-in-chief of an army in only a few years – the highest ranking person of color in the Western world until the 1970s. His story rivals the ones in his son’s books – a shipwreck, suspected poisoning, foreign dungeons, and finally being ostracised because of changes in France’s political climate and Napoleon’s personal ire. I really enjoyed this book – Tom Reiss is a great writer working with a great subject. I couldn’t wait to see where Dumas’ life took him, but I also never felt like Reiss took any liberties with the truth – everything was meticulously cited. I learned a lot about France’s colonial history as well, which I didn’t know much about. I can’t believe that someone who broke as many barriers as Thomas-Alexandre Dumas isn’t more well known, but thanks to Reiss’ efforts, that will hopefully now change. I’m also hoping that Thomas-Alexandre Dumas shows up in the recently announced Assassin’s Creed game set during the French Revolution. This entry was posted in Books, Reviews and tagged biography, france, history, non-fiction by Kriti Godey. Bookmark the permalink.